The WIMSIG Conference: Celebration of Women in Mathematics is scheduled to be held on September 25-26, 2017 at the University of South Australia. The Women in Mathematics Special Interest Group (WIMSIG) of the Australian Mathematical Society is organizing the first such conference in Australia to promote gender equity in Australian mathematics. On 24 June 2016, eight new institutions joined the SAGE Pilot of Athena SWAN at the SAGE Symposium in Sydney, bringing the total number of participating institutions to 40. SAGE is an Australian pilot of the Uk’s Athena SWAN program . It covers STEMM fields, and almost all Australian universities have signed up for the first two pilot cohorts. This entry was posted in active on September 12, 2016 by Sunsook Noh. The second meeting of the IMU Committee for Women in Mathematics took place in the IMU offices in Berlin, Germany, July 19, 2016. The main subjects for discussion were, 1) subject based research networks for female mathematicians, as supported by AWM, 2) brief reports on the CWM funded activities in 2016, 3) discussion of possible new activities for 2017, 4) a report on (WM)^2 and CWM at ICM Rio 2018, 5) a possible project to collect data on the gender gap in mathematics in cooperation with other scientists, 6) the CWM website and email contact list, and 7) a new call for activities to be funded by CWM in 2017. CWM’s second meeting. 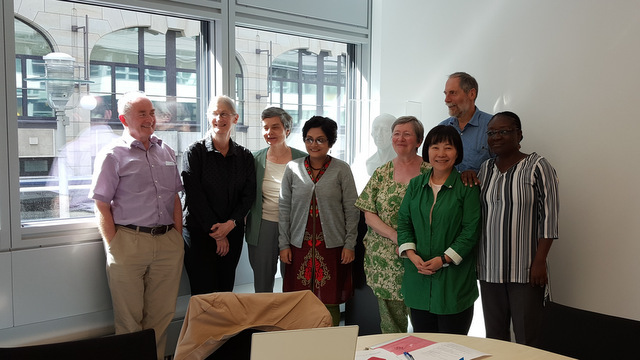 Left to Right: John Toland (EC liaison), Karen Vogtmann (for Kristin Lauter), Caroline Series, Shreemayee Bora (for Sujatha Ramdorai), Marie-Françoise Roy, Sunsook Noh, Bill Barton, Marie Françoise Ouedraogo. Photo by Gerhard Telschow (IMU staff). This entry was posted in active on August 15, 2016 by Sunsook Noh. During the weekend of 16 July, 2016, the Council of the European Mathematical Society convened at the Humboldt University in Berlin and elected 5 members at large of the executive committee for the next 4 years. Among the elected members were two women mathematicians, Betül Tanbay (Istanbul) and Beatrice Pelloni (Edinburgh). Congratulations to Professor Tanbay and Professor Pelloni. The official announcement can be found here on the European Mathematical Society web site. This entry was posted in active on August 11, 2016 by Sunsook Noh. For ICM 2018 in Rio de Janeiro, 2 of the 6 prize committees are being chaired by women mathematicians. Congratulations to Professor Series and Professor Fonseca for their appointments. Additional information about the prizes can be found here on the IMU website. On 1 July, 2016, The London Mathematical Society announced Caroline Series FRS, as its President-Designate. She will become the 80th President of the society and only the third woman president to serve in one of the most prestigious and historical mathematical societies in the world, founded in 1865. The first woman President was Dame Mary Cartwright who served from 1961 to 1963 and the second was Dame Frances Kirwan FRS who served from 2003 to 2005. 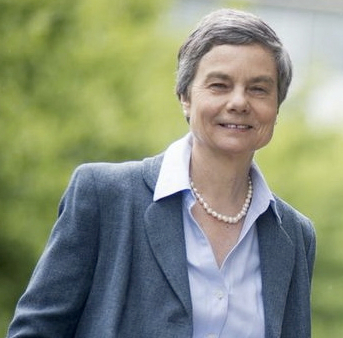 Professor Series will begin her term as President in November, 2017. Congratulations to Professor Series, who is also currently serving as the Vice-Chair of the IMU Committee for Women in Mathematics. Additional information about Professor Series, Emeritus Professor at the University of Warwick, UK, can be found in the official announcement from the LMS.